To the untrained eye I was just lazing around at Via Vai near the beach feeding my face and slurping a cold drink but another lovely afternoon was shaping up nicely. 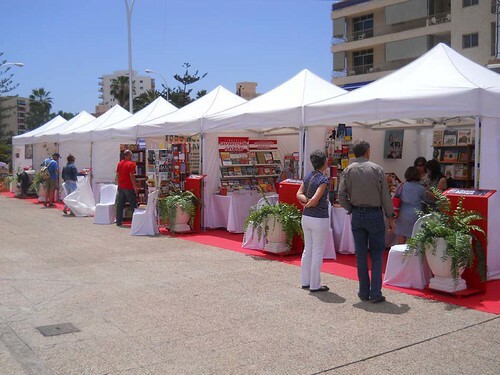 The Feria del Libro (book fair) was on its last day outside the Los Cristianos Cultural Centre, not just stalls with a range of books on culture, food and local history but also a stage where I saw soprano Candelaria Gonzalez shake the rafters at the opening presentation. 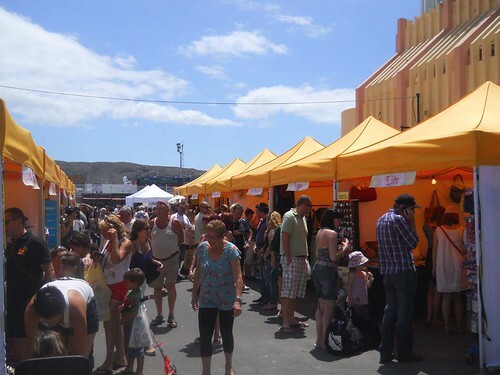 On the way to my lunch break I had popped into the 2 day Feria de Oportunidades (bargain fair) where over 40 Arona business’s had taken stalls to clear oldstock at crazy prices. It was bustling quite well with some heavy scrummig down at the more popular clothes stalls. Never get too near to a woman in search of a bargain, they are lethal, some of the stall holders were thinking about ccalling in a UN peace keeping force at one point. To the side of the stalls there was a large bouncy castle slide for the little ones to play on, they could have let me have one go down the slide it looked great fun – apparently I’m a bit old – ageist or what. Back at my food stop a few shoppers were comparing the contents of their bargain bags and were well chuffed, in thes tight times it’s a helpful boost to struggling local business’s and adds another attraction to a fairly quiet Saturday afternoon. Looking across to the ferry port I could see the top deck of an unusually sleek and stylish boat peering over the usual fishing boats along from the old beach. I normally head round that way for a relaxing walk and a chance to talk to the fishes – their sport knowledge is sketchy but they are quite opinionated about the latest film releases. 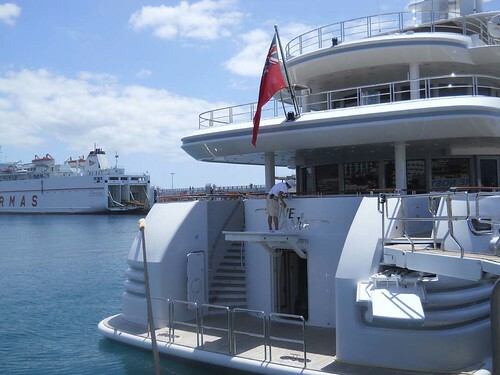 As soon as I got near, the size of this motor yacht impressed me, obviously a very rich persons plaything and in 10 years here I have never seen a private boat moored up near where the excursion boats load and unload. It’s an open area and quite a few people had gathered to admirre the gleaming craft, the name Vive La Vie didn’t tell me much and a red flag with a Union Jack in the corner puzzled me. Someone mentioned the Cayman Islands and later research showed this to be right on the money, the motto on the flag said He Hath Founded It Upon The Sea . A big chap who didn’t look short of a euro disembarked down the gang plank and in perfect polite English answered a few general questions and was suitably vague about the yachts owners. I did ask for a tour on board but got the no I expected. 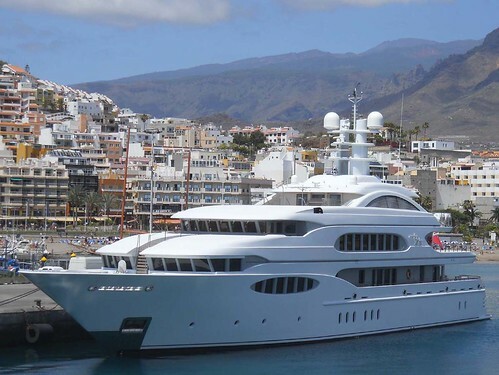 Anyway a mix of scraps of info and later frantic internet action told ne the 60 metre yacht was built in 2008 at Bremen, Germany by Lurssen to specific specifications for “a man and his family”. Top speed is 18 nautical miles an hour, it can sleep 12 each of crew and guests but most impressive of all was the fantastic inside design with a hi tech modern lounge, a fitness room, bedrooms that would shame many hotels, and a jacuzi. The yacht may be out on charter, aa notice on the gang plank made it clear that privacy would be protected with 24 hour security. We may never know who are illustriuos visitors are but they are sure to be impressed by Los Cristianos as it was at its dazzling best.